Passive programs are a great way to engage kids, whether they’re hanging out after school, coming in on a school-free day, or are just looking for something to do! They often require minimal effort to prepare and get off the ground, but are then good for hours of fun and engagement. If you’re looking to add school age passive programs to your library’s offerings, want to freshen things up, or just try something new, take a look at some of these great options! 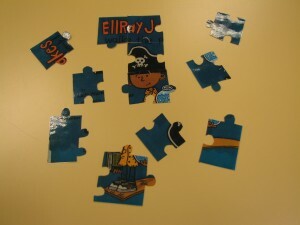 Make copies of a book cover, laminate, cut into puzzle pieces, and set them out (above)! Put “postcards” out on a table and encourage kids to write a postcard to their favorite author or book character, like in The Show Me Librarian’s blog post. Bonus fun if you can find a place to display them in the library! Take a look at this collection of passive program ideas from Jbrary. We all know Pinterest is a great resource for ideas. There are lots of passive programming boards out there, so find your favorites or start with this one from Central Mississippi Regional Library System. See what you can do with cardboard squares and plastic cups over at Library Learners. 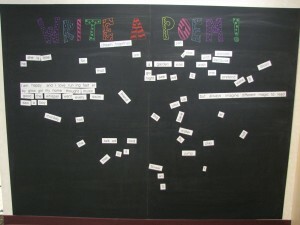 Have some fun with magnetic poetry (left)! If you have a magnet wall like the one pictured here it’s extra easy, but you don’t need something as elaborate as this! Try painting some cardboard with magnetic paint and lean it against a wall or set it on a table, and you’re good to go. If you have a magnetic surface, there are lots of cool options to consider. Those book puzzle pieces pictured above? There’s magnetic tape on the back of each piece, so they double as magnet puzzles (below). Mad Libs provides some fun, free downloads, and you can find lots of other Mad Libs-style downloadables elsewhere online. Print them out, set them on a table with pencils or pens, and let kids get extra silly! Or, find a paper Mad Libs booklet and set that out instead! Build your own Tinker Toys and let kids create like at Never Shushed. When it comes to passive programming, this is just the tip of the iceberg. 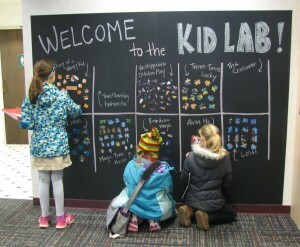 What awesome passive programs are you doing with your school age kids? Kelsey Johnson-Kaiser is a youth services librarian at the La Crosse Public Library in La Crosse, WI and a member of the ALSC School-Age Programs and Services Committee.